With vast numbers of PDF documents stored on websites, networks, and computers, organizations are challenged with keeping tabs on accessibility standards compliance. CommonLook Clarity enables teams to test and maintain the accessibility of an organization’s PDF resources. Clarity complements other accessibility solutions which scan HTML/CSS content, to comply with ADA Title III, WCAG 2.0, Section 508, HHS, PDF/UA or other accessibility standards. How to be compliant with accessibility standards? 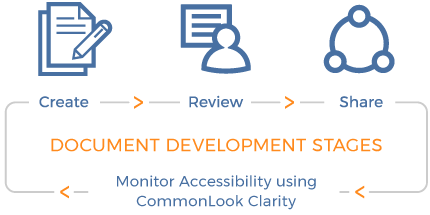 CommonLook Clarity provides compliance, remediation, and communications teams with the visibility they need to manage document accessibility from authoring through to distribution. Identify documents verified using CommonLook PDF and CommonLook Office. 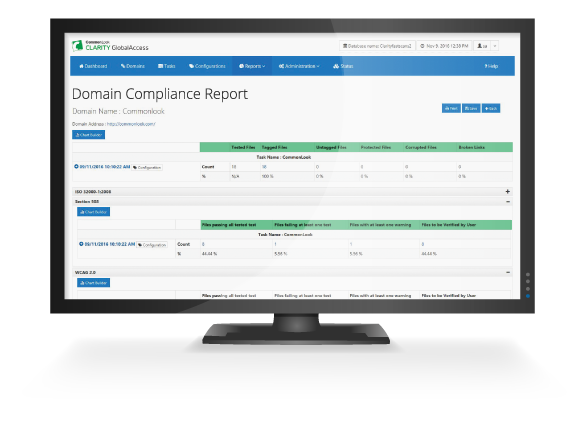 Clarity reports boost visibility on compliance status to help teams make smarter, faster decisions. 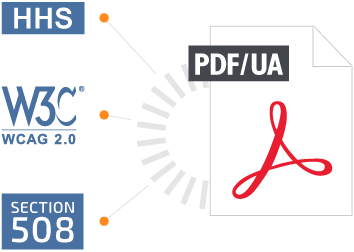 Evaluate any PDF, and identify and fix issues to make it accessible. How to avoid accessibility lawsuits for non-compliance? Choose the plan that matches your needs and works best for your environment. CommonLook software is also available for on-premises server installation. Enjoy unlimited access to CommonLook software for an annual fee. Avoid hardware investments and maintenance charges while we host the software. Get the same Clarity reports, on a regular basis, while saving time and money. We handle the hosting and scanning for a very affordable price. Visit the CommonLook Clarity Update News page.